We are now using the IKEv2 VPN protocol in place of the OpenVPN and L2TP VPN protocols. IKEv2 is specifically recommended by Apple as the preferred protocol for VPN apps running on macOS. Users can enjoy the same high levels of security and privacy that OpenVPN provides, while benefiting from improved performance. We have rewritten the entire CactusVPN macOS back-end from scratch. The app is now using the most up to date technology, as recommended by Apple. Some users have reported freezing issues with the app. This has been resolved, and is no longer a problem. 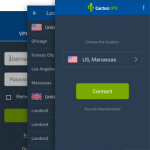 We have streamlined the CactusVPN macOS app, for a faster installation and increased ease of use. We have also resolved a security vulnerability reported by the security firm VerSprite. The issue was related to OpenVPN source code, rather than our own code, and is no longer a problem. 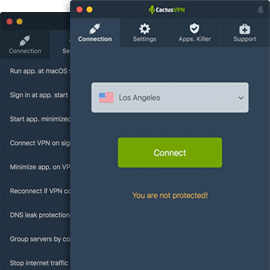 CactusVPN immediately dealt with the issue, and CactusVPN macOS users are not at risk from the vulnerability. We do recommend that all our users ensure that they have the recent version of our app installed. This is the best way to guarantee that your operating system is not at risk from security vulnerabilities. Software programmers are constantly finding solutions to potential risks, and the best way to benefit from their essential work is by making sure all your applications and programs are completely up to date.